Evans, a nonconforming, brilliant, and arrogant archeologist of the late 19th century, made the amazing discovery of the Minoan civilization on Crete. Macgillivray focuses on both the man and the discovery in this revealing book. 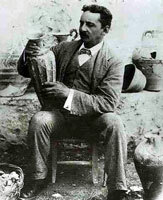 On March 23, 1900 Arthur Evans began his excavation of Knossos on the island of Crete. He was not the first to dig there, but he uncovered the Knossos Palace and discovered what he called the Minoan civilization, after the legendary King Minos of Crete. He spent the rest of his life working on it. He was an amateur archeologist and by today's standards, it was a very sloppy excavation. But he was able to preserve the remains of the Minoans, which might have been lost. The Palace at Knossos has the same architectural design found at other Minoan palaces. There is a central courtyard, with living rooms and storage rooms off the courtyard. The palaces were the economic, social, religious and political centers for the Minoan civilization. This palace dates to 2000-1350 B.C.E. Four wings were arranged around a central courtyard, containing the royal quarters, workshops, shrines, storerooms, repositories, the throne room and banquet halls. Artifacts discovered have given valuable information about Minoan social structure, religion, clothing, everyday life and diet. The palace had hypocaust heating and plumbing which brought in hot and cold water and flushing toilets. Although important economically, the Minoans were apparently not a military power. The cities had only minimal defensive walls, unlike other Bronze Age civilizations. Their extensive fleet probably provided all the protection that they needed.